Summary: Porcupines and echidnas both have spiky spines. Turtles and snails both have shells. Yet these animals aren’t related to each other, and, in the case of the porcupine and echidna, don’t live on the same continents. Animals often evolve with shared traits, even if they’re not closely related. 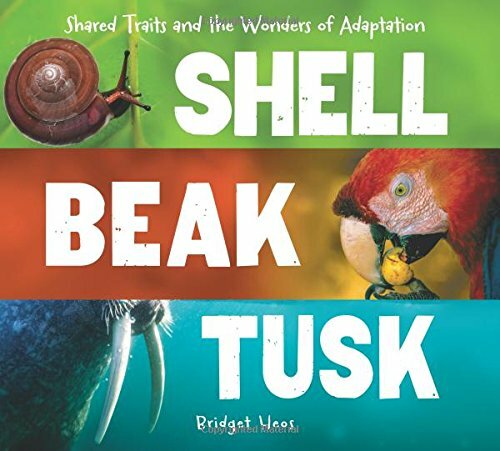 Each two-page spread shows a photograph of both of the animals with a paragraph about that animal and the trait the two share. The first and last page give additional information about adaptation and evolution. Includes a pretty extensive bibliography and an index. 32 pages; grades 1-4. Pros: The large, colorful photos provide a draw to pick up this book. The idea of shared traits is an interesting concept that could be extended by having kids think of and research other animals who have shared traits. Cons: The writing and format are pretty straightforward, and may not have as much appeal as some flashier books about animals.